So happy to have combined papaya with hazelnut. 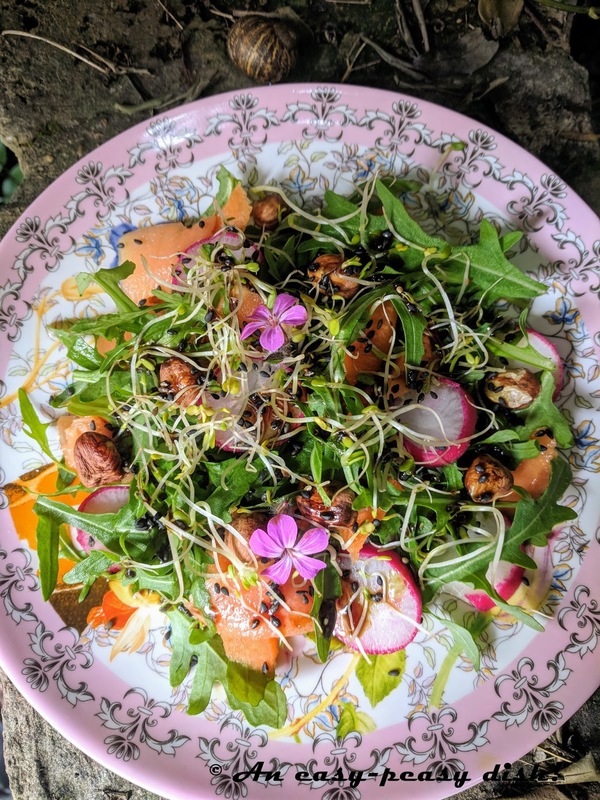 It gives a "je ne sais quoi" absolutely delicious... Once again, a terribly easy dish to prepare "on-the-go", as my children like to say, and with lovely colors a feast for your eyes too! Wine pairing : Kessler muscat (Sweet white) from Alsace. On a bed of rocket salad, arrange the papaya with the radishes and the carrot. Sprinkle with the black sesame and the hazelnut. Toss to combine with pumpkin oil. Serve. Sur un lit de roquette, disposez les morceaux de papaye avec les radis et la carotte. Parsemez de noisettes et de sésame noir. Mélangez bien avec l’huile de potiron. Servez !